Global Biopharmaceuticals Market - Growth, Trends and Forecasts (2018 - 2023) - Biotech Stocks | Biotechnology Investments and News. The Future of Innovation & Discovery. The global biopharmaceuticals market is estimated to reach USD 341.16 billion in 2023. The market is expected to register a CAGR of 8.5% during the forecast period (2018 – 2023). North America dominates the market due to rapid technological advancements. Opportunities in biopharmaceuticals have been increasing over the past decade. The efficacy and the safety of the drugs are some of the key product features that drive the market’s growth. There have been biopharmaceutical products that are improving the quality of life and reducing the death rates in patients with HIV/AIDs, cancer, cystic fibrosis, rheumatoid arthritis. Biopharmaceuticals have reduced the number of deaths caused due to cancer and HIV/AIDS in the last decade. The efficacy of the drugs and their safety has increased the acceptance for biopharmaceuticals. Unlike conventional pharmaceuticals, biopharmaceuticals are manufactured using living biological systems. Due to this, biopharmaceutical manufacturing requires specialized equipment and devices such as incubators that can support these biological systems. The cost of these devices and equipment is high as compared to regular manufacturing equipment. Along with this, most biopharmaceuticals require custom built manufacturing equipment and highly specialized personnel to operate them. Due to these high-end manufacturing requirements, the resources and time required to setup a biopharmaceutical manufacturing facility is very high, which makes scaling really tough. So, these factors are acting as a restraint for the BIOPHARMACEUTICALS market. The biopharmaceuticals market is segmented by type of treatment and geography. By geography, it is segmented into North America, Europe, Asia-Pacific, the Middle East and Africa and South America. North America dominates the biopharmaceuticals market due to rapid technological advancements and high investment & funding to support development of biopharmaceuticals. 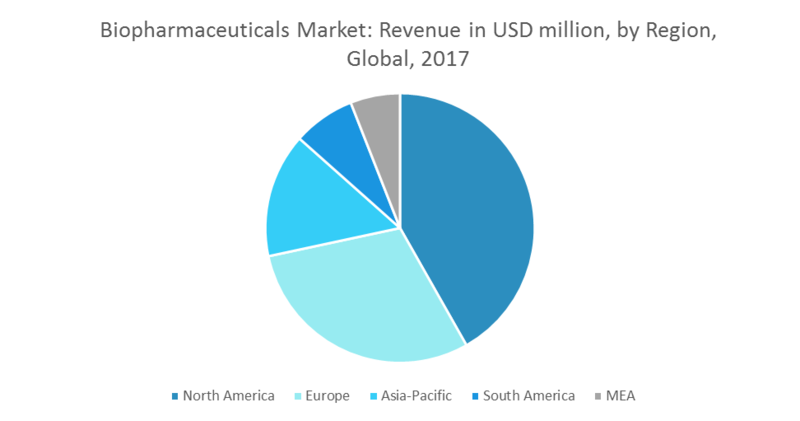 Asia-Pacific is also expected to propel the biopharmaceuticals market owing to factors, such as increasing accessibility to healthcare facilities in the region and increasing economic growth.